In 2012 the President of the Alberta Citizens on Patrol Association contacted the Manitoba Provincial Coordinator, Tracey Proctor about the Manitoba Program. Tracey was invited to attend the Alberta Conference and discussion took place about the operation of the Provincial Programs. After that, contact was made with Nova Scotia, British Columbia and Prince Edward Island COP. They were all invited to attend the 2013 Manitoba COPP Conference to learn more about the Manitoba Program and meet members from across the Province. After the conference a meeting was convened with the visitors in Winnipeg, Manitoba. Concerns of all programs were discussed and it appeared that operational concerns were similar. It was then decided to form a National Association so that best practices and strategies could be shared to benefit all groups across Canada. It was agreed that this would strengthen and expand the impact and scope of the community safety goal of Citizens On Patrol. An executive was appointed as follows: Bev Salomons, Alberta as President; Elsie Reid, Manitoba, as Vice-President; Betty (Elizabeth) Woolridge, Nova Scotia, as Treasurer; Brian Cornborough, British Columbia, as Secretary and Harry McLellan, Prince Edward Island, as Director at Large. It was decided that CCOPA would be composed of one representative from each Province who was a member in good standing of the COP Program. From left to right: Harry McLellan (PEI), Bev Salomons (Alta), Elsie Reid (Manitoba), Betty Woolridge (NS), Brian Cornborough (BC). Requests for funding were sent to Governments, Government Agencies and Organizations and Law Enforcement Agencies. Encouraging responses were received but only minimal funding was raised. It was determined that until we were an incorporated entity we would be ineligible for funding from Grants, etc. The funds that we did receive from Manitoba COPP, ACOPA and PEI COP were sufficient to cover the cost of incorporating as a Federal (National) Association. We are now a National Association. The mission of CCOPA is “to provide support and foster growth and development of all Citizens On Patrol Programs in Canada”. All business for the 2013-14 year was conducted by e-mail and phone as no funds were available to pay for travel costs for personal meetings. 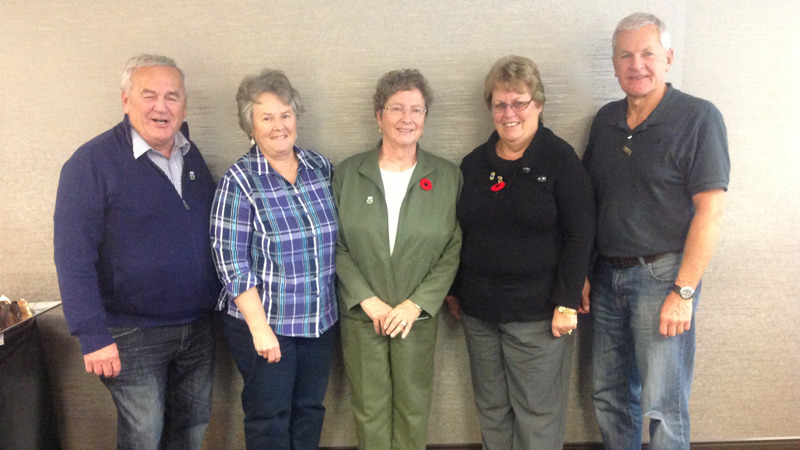 After the 2014 conference a second meeting was convened with the out of Province visitors, the Manitoba Provincial Coordinator, the Manitoba Representative, Elsie Reid, a member of the RCMP and two guests from Alberta. The President advised that she had meetings with Law Enforcement and had done newspaper and TV interviews in Charlottetown PEI while on a personal visit in May of 2014. Encouraging responses were received from that publicity. She had also been in contact with RCMP Depot in Regina. Further discussion at the meeting was raised as to the importance of the relationship of Law Enforcement with COP members across Canada. Many groups do not have a clear working relationship with Law Enforcement and RCMP Cadets and Recruits posted to some communities are not familiar with the COP Program. If appointed as an RCMP Liaison to a COP Group they are not aware of the goals of the Program. The RCMP Constable present at the meeting noted that she was unaware of COP when she left Depot. The President advised that when she had been in contact with RCMP Depot, an invitation was extended to CCOPA to attend and make a presentation to the Cadets and explain the Program and purpose of the COP Program. This was discussed by the Executive and it was unanimous that when funds became available possibly two members of CCOPA could attend Regina to make this presentation. The suggestion brought forward was that perhaps members across Canada might be willing to contribute $1.00 per member as a membership fee to CCOPA. A letter of request sent by the President to all groups in November of 2014. It is a voluntary contribution that would assist in the forward development of all COP Programs. Contributions to the CCOPA assist in sharing important community safety information across Canada and providing Law Enforcement with more information on the Citizens on Patrol program, thus helping to prepare the RCMP Recruits to be better prepared when they get the assignment to be the Liaison for the local Citizens On Patrol program.